Several recent posts on Corona’s forum have mentioned lines-of-code (LOC) metrics for some simple game mechanics, and it got me to wondering about what sort of metrics were “typical” of various little prototypes that I’ve tinkered with. You can perhaps use these samples as rough guides for answering the question “what can be accomplished with x amount of coding?” Granted that not all coding styles are equivalent – the reader’s may be more/less verbose than my own – so take this as a rough guide only. Note that all of the following prototypes were done with “plain vanilla out-of-the-box Corona.” None of the following prototypes use any other external plugins or libraries – the metrics given are for their entire set of code. Also note that the genre of game can potentially be a significant factor to how much effort is needed to accomplish something minimally functional. All of the prototypes below are based on relatively simple genres to begin with. Finally, note that none of these prototypes are full games. There’s almost always way more work involved in all the other aspects of a finished game, and these prototype metrics make no attempt whatsoever to capture any of those aspects. A frequent source of frustration in the forum seems to be the loading Tiled maps since (at present) Corona offers no built-in support. Well, let’s put that to rest, shall we? Since Tiled will export to Lua format, loading its data is crazy simple. Sure, it’ll take another 40 or so lines to actually render it in some minimal way, and maybe another 30 or so lines to implement a minimal camera for scrolling. (and perhaps many hundreds more lines if you had the lofty goal of implementing every last feature that Tiled supports, rather than just what you actually need) But I’ll leave those as tasks for the reader, or a later post, because it’s off-topic, and there’s really just not that much to it. This installment is going to be a bit different. I thought I’d discuss some of the more “personal” aspects of development, using ROBOT-SB as the example. If that’s not that what you’re here for, I totally understand — feel free to skip this one, maybe come back next time for more coding talk. Why do I make games? Perhaps to make a load of cash? Hmm, sure, that’d be a nice bonus, but wouldn’t really keep me motivated. In truth, I do it because I just enjoy the creative process and technical challenges – this is a hobby, rather than a job. Further, and more importantly, I enjoy the fact that my kids like being part of the process, as it gives us yet another thing to do together, and they’re pretty good at thinking up game ideas. Early on, ROBOT-SB with pretty “stingy” with its awarding of stars (the in-game upgrade currency). This was mainly due to not yet having tuned the cost curves – everything was essentially too linear and too cheap. So the “quick fix” was to just make it harder to get stars. As the cost-curve developed, eventually I was going to need to go back and re-balance the star awards in order get it all working. My son Nick noticed this problem before I actually got around to fixing it — he’s my in-house alpha tester. He came to me saying “It’s too hard to get stars”, and of course, he was right. So, the two of us sat down one day and brainstormed possible ways to award more stars. Sometimes, rather than brainstorm interactively, I’ll take a collected group of ideas and suggestions, try to pre-implement them quickly, then show them off to my alpha-testers to gauge reactions. Most of this comes about from random comments of the form “it would be cool if it could…”. And you know how kids think, so finish the comment with things like: ..have a super-mega-ultra-gun, be invinvincible, ..look like Mine Craft, ..et cetera. Anyway, hope you enjoyed a bit of behind-the-scenes, I’ll be back to technical stuff next time, cheers! ROBOT-SB is essentially a “one-tap” game – tap to change direction, trying to dodge and/or shoot the various obstacles. 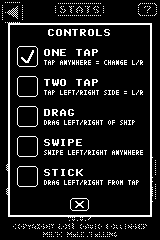 But it need not be just a “one-tap”, as there are a number of control schemes that could work with it. I debated long and hard whether to allow alternate control schemes, primarily because I felt it might unfairly tip the leaderboards in favor of one control scheme or another. Plus, there was also a bit of irrational desire to preserve some sort of “artistic purity” imagined to be present in the one-tap scheme – but that was easily shed. I had mocked-up various control schemes while “hacking” the game with my son (aside: actually, we’ve hacked in all sorts of wacky stuff, like super-guns, invincibility, even reskinned it with some ‘borrowed’ Minecraft art) but never truly tested them. The only way to truly settle the issue was to properly implement and test these alternate control schemes. And you know what? The choice of control scheme doesn’t have that much effect on scoring potential after all, so the argument regarding leaderboard preservation went up in smoke. I figured I’d talk about how I structure the code to make this “easy”, as maybe it’d be of use to someone else. The way the code works is that each control scheme is its own class, following a common interface and referencing a common “control state” where it’s “output” is stored. So all that’s really necessary to implement the various schemes is to just create an instance of the correct class. Another advantage of the tabled control schemes, and the way the player references the controls, is that it would be easy to drop in a “game.controls.DemoAI” control scheme, for example, if I later decide to do the “game plays itself in demo mode underneath the main title screen” thingy. Then just create a game instance that overrides the user-preference setting with a request for the “demoai” controls, and presto! instant demo mode. It doesn’t do this at present, and probably won’t ever, mainly because of low-resolution “clutter” concerns, though it’s something that’s worked successfully for me in other games. One of the components that I needed for ROBOT-SB was bitmap font support. I didn’t need anything elaborate – in fact, given the low-resolution that I’m working at, I hardly needed a proper “library” at all, just a few “helper functions” might have done the job. So I began by exploring extant solutions, hoping to avoid reinventing the wheel if I could find something suitable already out there. But the libraries that I found were either 1) outdated, and I had no desire to spend time updating someone else’s code that might not end up being what I needed anyway; or 2) a bit too elaborate, in that they weren’t focused on the particular issue that I needed to solve, primarily: proper pixel alignment. So, in the end, I reinvented a toy-sized wheel, and I am oh so proud to now present you with.. wait for it… tah dah… SimpleBitmapFont! I’m pretty sure that letters that look like fire are still cool, right? 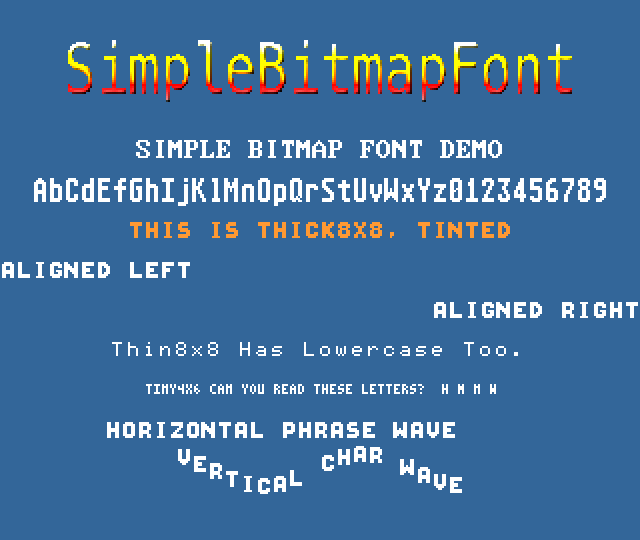 Please note that it is definitely not intended as the be-all-end-all implementation of bitmap fonts! I’ll leave that to others with grander aspirations. But feel free to use it as a jumping-off point if it seems more-or-less appropriate for your particular project. “What If” you could somehow magically teleport (aka dev hack) a plain, base, un-upgraded ship to wave 99, how would it do? Not so well. But that’s really no surprise, wave 99 should be difficult even with an upgraded ship.. 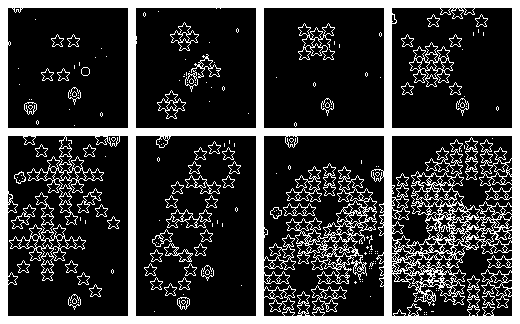 The difficulty curves aren’t tuned out this far, this is really just an experiment. Difficulty is “mostly” tuned out to wave 60, then essentially of runs linearly from there. That ought to be enough to challenge even hard-core players (don’t expect a casual player to make it much beyond about wave 10 or so). Options screen is now functional and handling varying resolutions – such stuff isn’t very glamorous or exciting to talk about, but it’s gotta get done.. Performance. Benchmarking. Blech! There is perhaps no more controversial subject. But I’ve got a little tidbit of info to share on the subject, so let’s dive right in, shall we? There’s a wealth of information out there on the dangers of optimizing, and why you shouldn’t bother unless you’re sure it matters. In fact, you might even make things worse if you just operate on assumptions rather than actual benchmarking. So my intent in sharing this little tip is NOT to suggest that anyone should just use it blindly. Rather, just file it away for possible consideration in case you’re faced with an actual scenario that benchmarking has indicated this specific problem. Also: This whole discussion only applies to the current build of Corona SDK as of this writing, its specific implementation of internal data structures, and its specific version of Lua (5.1.5 as of this writing). Any of that could change without warning, at which point this discussion may be rendered useless. But don’t just take my word for it, benchmark it for yourself, on your own devices. Get the entire source code here. Actual results will, of course, vary from device to device. Note, for example, that my poor Nexus 7 2013 has been so heavily used that its overall performance has deteriorated, to the point where my 2012 outperforms it, on this test at least. Still, as a generalization, and apparently regardless of the specific device, a “get” from a DisplayObject takes about 5X longer than a simple table access, while a “set” from a DisplayObject takes about 30X longer than a simple table access. The root of the matter is that DisplayObjects are fundamentally different things than plain-old Lua tables. All the extra work necessary to drill through the DisplayObject table wrapper, through its metatable, into the proxied internal userdata representation of the display object, then push the result back onto the stack for Lua, adds up to a measurable performance difference. So, the first part of the tip is just to reduce access to a DisplayObject’s properties to the extent you can, using “obvious” techniques. At this stage, however, we need something more “practical” to benchmark than just raw access as above. The results above are interesting as indicators of where performance might be gained, but are too simplistic to be of direct use. In other words, it’s all well and good to claim that some micro-statement performs better than another, but how then to apply it practically? Thus, it’s useful when benchmarking to test something of just-enough complexity (without going overboard and confusing what’s being tested) to actually reveal whether one “whole solution” is better than another. Note that it isn’t strictly necessary to alias “rect.dx” here, as that access isn’t necessarily a problem – Lua’s hash-table access performance is really good. So, while repeated use of any table element might benefit from local aliasing (and this is a common performance technique in Lua), it is particularly true for DisplayObject properties (the topic herein). Well, that’s for benchmarking to decide, of course! If it’s just a single DisplayObject, then who cares? There’s not enough difference here to add up to anything measureable. But if you have, say, a thousand such objects, each updating 60 times per second, and you could perhaps also use those already-aliased values for collision detection or something else, then the cumulative effect might add up to something worth caring about. Now we come to the “non-obvious” (perhaps) techniques. It turns out that the difference between plain-old table access and DisplayObject property access is so large in relative terms (again, roughly 5X for get, 30X for set) that there exists an opportunity to “spoof” or “proxy” the DisplayObject’s properties with plain-old table elements, and still come out a winner. So, what did we do? We traded a get of rect.x, for a get/set of rect.xp. Unfortunately we can’t get rid of the set of rect.x (which is the larger of the two performance issues) because eventually we need to actually update the rect’s position. I wish Corona SDK offered something like a “moveTo” method – an absolute version of the existing relative “translate” method. That would be worth comparing! But, it is still a net performance win because a get/set on a plain-old Lua table element takes less time than a get on a DisplayObject property. I mentioned above my wish for something like a “moveTo” method on DisplayObjects, an absolute version of the existing relative “translate” method – essentially a “setXY(x,y)” method. There would likely be some performance tricks that could be wrangled out of such a method – it would at least be worth comparing to other techniques. Still, if your total usage is as simple as the “bounce” code above, it might be worth trying to substitute in a relative obj:translate(obj.dx, obj.dy) and benchmark it. But I’ll leave the actual benchmarking a homework assignment for the reader -if the reader is interested enough to try it. Basically: Are two reads and a function call better than two writes? Suffice to say that “translate(1,1)” will handily beat “x=x+1; y=y+1” -type code, but then you’ve got the bounce logic to factor in – assuming you want to fairly benchmark and produce same results as the other examples – and you’d potentially lose the ability to reuse those “spoof” values elsewhere. Granted that we’re only talking about a ~15-20% difference in the second example. There is nothing earth-shattering here. So, whether or not there’s any practical way to apply this tip would require benchmarking of specific situations. The more you could potentially reuse and take advantage of these “spoofed”/”proxied” values, then the more you could potentially gain over repeated DisplayObject property access. Also note that this applies not just to x|y, but any DisplayObject userdata property. Say, for example, you needed (for whatever reason) repeated access to an object’s .width (and assuming that it is unchanging), then spoof it into rect.myWidth=rect.width once, then use rect.myWidth thereafter. Welcome to the third installment of the “pixel perfect” series. This is the one where I’m supposed to quit stalling and actually talk about the subject rather than more boring preliminary background material (BPBM). What?! You don’t like BPBM?!?! Yeh, ok, I’m with ya. Though, by the way, there’s plenty of BPBM in part 1 and part 2 if you’re into that sort of thing, in case you missed it. Feel free to just download the source for example 1, example 2 and example 3 if you’re the type who does better studying actual code and would rather skip all the reading. First, a quick reminder of the goal: to create a “low-resolution retro blocky pixel” configuration for Corona SDK that displays properly and without aliasing artifacts on a wide variety of target devices, resolutions and aspect ratios. Note that there’s nothing “magical” about 160 specifically, other than it’s convenient for this project. 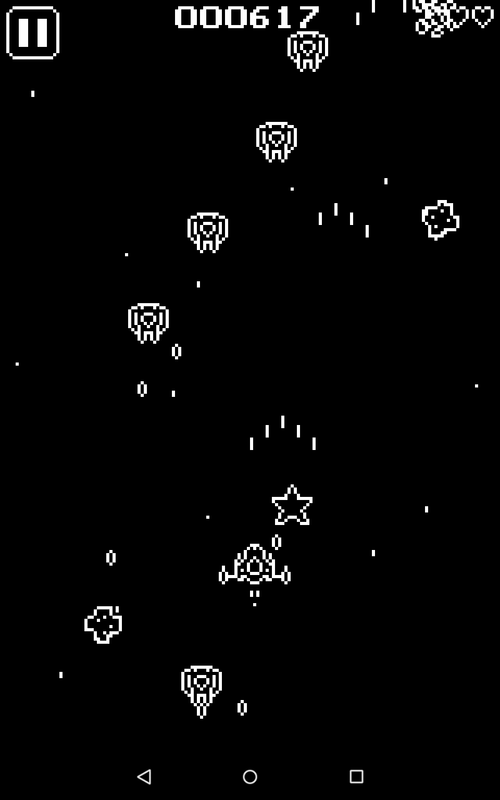 It’s similar to Game Boy resolution, and a nice-enough divisor of common mobile device resolutions, that it was worth adopting, at least as a baseline. So that’s the dimension I’ll use for the rest of this discussion. In previous installments I mentioned that something, somewhere will have to be “flexible” in order to accomplish this goal across the wide variety of devices. So, in this installment I’ll present two approaches: a simpler one, that “mostly” accomplishes the goal, with perhaps-acceptable compromises; and a more complex one, that does accomplish the goal, though with additional considerations that will have to be dealt with in program code. Throughout this discussion I’ll be assuming portrait orientation just so I can adopt a single set of terms. But all of these concepts will apply similarly to landscape orientation. If you carefully apply the foundations (ie, the BPBM) covered in the first two installments, then this approach can work pretty good under some conditions, and is so simple as to almost not warrant any discussion at all! But, it is not “pixel perfect”, except on a limited range of devices. What it is, actually, is “pixel-acceptable-but-does-preserve-fixed-content-width”. However, there are aspects of it that will apply to the more complex solution, so it’s worth covering first and explaining a bit before presenting something more complex. Good for you, you’re starting to catch on. Or, grab the entire source code for this example. The only thing even a little bit “tricky” in there is calculating the height based on the device’s aspect ratio. It’s important to note that config.lua treats width and height as integers. This isn’t documented anywhere, but is easy enough to test: just “request” a content width of say 321.4 or a content height of 478.2 in config.lua, then report in main.lua what your actual values are for display.contentWidth|Height – they’ll be integers. display.actualContentWidth|Height are where you need to turn for the final resulting and potentially fractional* values. So, the use of math.floor() on the calculated height assures that if the aspect ratio math doesn’t work out to an even integer (as is common with 4:3, 5:3, 16:9 or any other aspect ratios with repeating decimals) then we’ll always specify “just under” the exact fractional height, which will cause a “tiny bit” of vertical letterboxing. Any residual fractional-pixel letterboxing will manifest itself as a difference between display.contentHeight and display.actualContentHeight. What we don’t want is any of that residual fractional-pixel letterbox height affecting the pixel alignment, and by default yAlign=”center” will split that fraction among equal top and bottom letterboxes*, causing a non-zero display.screenOriginY. By using yAlign=”top” it will force any residual fractional-pixel letterboxing to all occur at the bottom of the screen, maintaining display.screenOriginY=0, and preserving the origin of content-versus-device pixel alignment. * Maybe in a subsequent post I’ll delve into some other “weirdness” that crops up with Corona SDK, perhaps due to internal precision or rounding issues, if you ever attempt to “fact-check” the various display. * metrics with actual hand-calculated math. Things just don’t add up right. It’s definitely relevant, and factors into the solution presented here, but it’s pretty esoteric stuff. Suffice to say there are sufficient reasons for preferring “left”/”top” alignment here. However, all is not as bad as it appears. Unless you’re actually using something like this QA pixel grid, which is intended to highlight problems, it’s actually quite difficult to see the inconsistent retro-pixels on-device once the hardware resolution approaches 800 or so (depending on display size, thus DPI). Pixel density beyond that tends to obscure these tiny irregularites. And since many of the more-popular lower-resolution devices (below 800, with low DPI’s) are covered by the 160N resolutions, perhaps the irregular pixels might be something you could just ignore. I know what you’re saying: “But I don’t want any non-square retro-pixels, ever!” Well then, something else is going to have to give, because 160 is simply not a common divisor among all the various devices. * That’s what the complex solution addresses. * I believe that since the odd 1125×2436 iPhone X, the greatest common divisor across all various device widths is now 1. I have no desire to use UV coordinates as content dimensions – but try it if you like, it’s “fun”. The difference between the approaches is that instead of keeping 160 as a fixed width as the simple approach did, the complex approach will allow a “160-or-a-bit-more” width, in order to obtain an integer content scale ratio against the device pixels. This implies that the rest of the actual app’s code must be “flexible enough” to deal with the varying content width (as well as height). This is the trade-off, and may or may not present further issues. It’s really no more complicated than “traditional” letterboxing concerns, though the “source” of the letterboxed dimensions are under our control. Consider the 768×1024 iPad. It would be possible to get perfectly square retro-pixels with 4×4 hardware-pixels if content width were specified as 192. 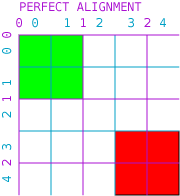 (768/192=4). Do you see a strategy emerging here? Essentially we’re looking for the greatest integer divisor of device width that will produce an integer quotient >= 160 for content width. Note certain similarities with the simple version – namely that we use “left”/”top” alignment, and calculate the height based on the device’s aspect ratio. The reasons why remain the same – BPBM. So, what are the practical results of using this config on a non-160N device width? You’ll end up with a content width that is slightly larger than 160, but (this part is critically important, so I hope you’re still awake) the content width that you end up with is guaranteed to be an integer divisor of device width. The extra content width needed to obtain an integer divisor is now a sort of “virtual letterboxed width” (as opposed to the actual letterboxing of height that was calculated). So, again, repeating myself a bit, the app will need to find something to do with that extra width. -- thus "viewport" is a centered 160 x aspectHeight area within that oversized content. Or grab the entire source code for this example. Whoa, whoa, settle down! This section doesn’t present anything truly new. Rather it just considers a possible hybrid of the prior two approaches taken together. Why? The worst-case scenario that I’m aware of for the complex approach, based on extant actual devices, is the iPad Pro’s 2048×2732 display. The greatest integer divisor that can be used is 8, giving a content width of 256. So that’s 96 additional content units of width to deal with – quite a bit (+60%), considering the initial desire for just 160 width. And maybe that’s just too much. So, based on the discussion of high-DPI devices above (in the simple approach section) maybe you’d rather use something like the simple approach in that case. Or, craft a “custom” divisor of your own choosing to reduce all that extra width. The trade-off being that you’ll lose perfectly square retro-pixels. That is, for such high-DPI devices maybe you’d be willing to switch back to non-perfectly-square retro-pixels just to avoid such an overly-wide content area. For example, use a divisor of 12 (giving 2048/12=170.666 content width) and with xAlign=”left” you could simply ignore any fractional pixels left-over on the right side,… right? That non-exact width means that, if you then reverse the math to check yourself, you won’t back a perfect integer divisor of 12. Rather, the divisor using these sample values would be 2048/171~=11.976. 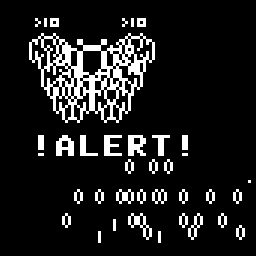 So you’ll still be close to an integer divisor, but not quite – probably closer than with the simple method alone, and the closer you are to integer the fewer non-square retro-pixels will result overall. 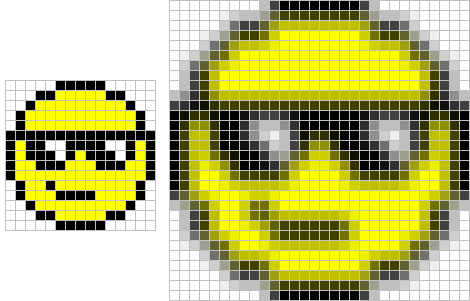 Let’s be honest – it’s not pixel perfect, and that WAS the topic, right? So why bother? Because mobile device development is often just a series of compromises. If a few percent of the pixels are a few percent anamorphic, that just might be good enough for some uses if it solved some other problem. So, let’s table all of the results from the complex approach’s math (at least for known common device resolutions), allowing certain specific values to be overridden when desired, and falling back on the simple approach calculations for everything else not specifically covered. Note that I’m not suggesting that this approach would be any better or worse than either of the two approaches alone, I’m just throwing it out there for consideration. It might benefit some use cases, but be of no value to others. BTW, it should be obvious for the nice 160N width devices that all of the three approaches are equivalent. That is, if the device dimensions are such that an integer pixel-perfect scale is readily achievable as is, then that is what is used. It’s only for the “weird” resolutions that extra considerations might need to come into play. If you’ve made it this far, congratulations! I honestly cannot fathom how you survived it. That’s probably the longest blog entry I’ve ever written, or am ever likely to write. Hopefully you’ve picked up a trick or two that’ll be of benefit to your specific usage. As for me, I have just now developed chronic carpal tunnel syndrome and will suffer in agony for eternity,.. probably,.. maybe,.. you’re welcome. Did you find this useful? Want to support future efforts? Feel free to give my apps some free promo, or make a contribution (it’ll go towards a good cause: more LEGO for my kids). Thanks! I’ll get back to the “perfect pixel” topic soon, but I’m interrupting it to cover some more current activity – a bit of pixel art “sweetening”. These are the sort of little tiny details that I love working on.